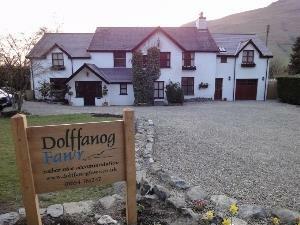 Dolffanog Fawr01654 761247work01654 761247fax Guest AccommodationDolffanog Fawr is an 18th century farmhouse that has recently been thoroughly renovated and converted into one of the finest small accommodation establishements in Snowdonia. The house offers truly luxurious accommodation in the stunning Tal-y-llyn valley in the heart of the Snowdonia National Park. It is located at the foot of Cadair Idris and overlooks Tal-y-llyn lake. The bedrooms are beautifully furnished with large top of the range pocket sprung beds, egyptian cotton bedding, handmade contemporary welsh lambswool throws and recently refurbished bathrooms. Alex and Lorraine serve very special home cooked meals using the best local produce and have an extensive good value wine list to match.